Customer: Beach Mold and Tool, Inc.
Project obstacles and solutions: Beach Mold and Tool in New Albany, Indiana announced in June 2015 that they were expanding their operations with a new 127,000 square foot warehouse. Beach Mold and Tool produces plastic parts and assemblies for a number of industries. The expansion project will be fully functional by July 2016. Koetter Construction was selected as the general contractor for this job. Broughton Concrete performed all of the flatwork. The warehouse was built with pre-cast concrete walls with an 8 inch concrete floor. 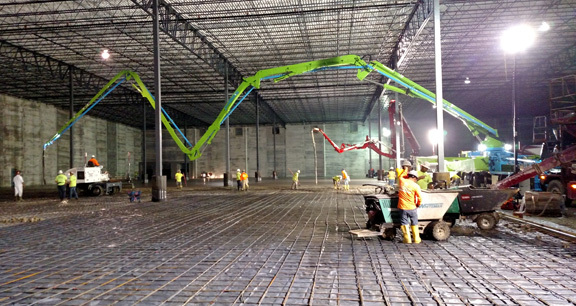 IMI supplied 3,300 yards of 4,000 psi concrete for the floors. Key to keeping this job on schedule were three large continuous pours for the slab-on-grade floors. IMI worked with Koetter's crews to deliver concrete for over 8 hours during the largest pours. IMI dispatchers and production personnel kept pace with the demand, delivering up to 175 yards per hour, which had a mixer truck pulling up to the site every three minutes. The concrete was placed using two boom pumps and six Georgia Buggies. The Broughton Concrete crews used a laser screed to place and level the concrete. The floors were reinforced with a rebar grid tied off to form 12 inch squares. Broughton troweled the floors to a fine finish. Pouring the warehouse floors in three large segments helped move the construction schedule along to the next operations. If you have questions about large pours, contact the sales representative for the plant closest to your locations. Click here.